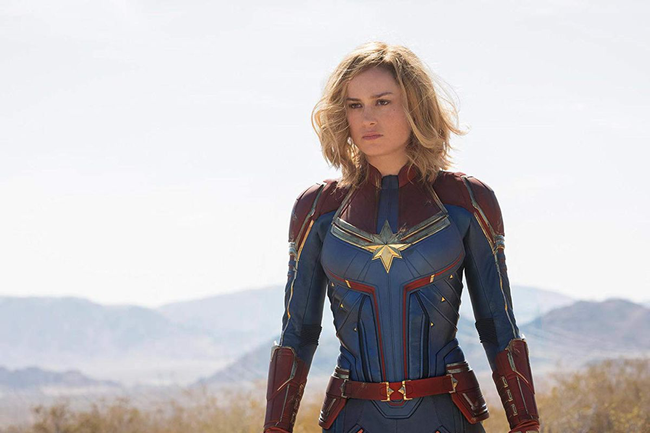 Unfortunately, Captain Marvel is very untidy, with a jumbled narrative which settles on the usual superhero clichés and without any real identity to set it apart from all the other comic book movies which are being constantly churned out by Hollywood studios since they've become incredibly profitable. If the only difference here is meant to be that it's a female superhero, it's just not original enough really. Set in the 1990's and thus pre-dating the other Marvel movies (except Captain America), Brie Larson takes the lead as 'Vers', a member of an elite military unit who protect their Kree species from alien interlopers. Suffering from amnesia, she finds herself separated from her team, stranded on Earth in battle with shapeshifting aliens and the only ally she has is government secret agent Nick Fury (prior to him being the leader of SHIELD in the other MCU movies). It becomes apparent to Vers that she's been to Earth before, and with Fury's help, she discovers her true identity, as well as uncovering the truth about her mission. The rest of the plot gets into spoiler territory, so I'm just going to leave it there. As a standalone film, the narrative is so choppy and it draws on so many plot threads and McGuffins from other Marvel movies that it really doesn't serve its purpose as an origin story. On the flip side, judging this film amongst the others in the MCU series, it's very much one of the weakest, without a real identity of its own and feeling quite bland and boring, not to mention that it completely retcons plot threads which have already become established. 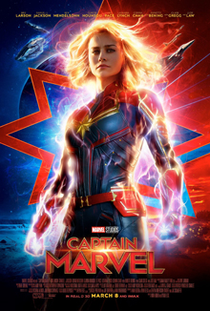 Brie Larson plays the lead as a blank canvas, vastly emotionless for the majority of the movie (in fact, I'd liken her to a middle-aged woman complaining at a supermarket customer service desk) and it's really only in the scenes in which she plays off Samuel L. Jackson's Nick Fury where any personality comes to the forefront. Ben Mendelsohn does a good job as the leader of the shapeshifting aliens, but the best performance in the entire film belongs to that of a cat (Goose), who sadly isn't in the film as much as you'd like him to be. The visual effects are of the standard you'd expect from a Marvel movie, and though the de-ageing effects do a good job making Jackson look 30 years younger, nothing else really blows the socks off and with all the build up surrounding this character, it's completely underwhelming when she discovers the range of her superpowers and her character arc simply being that she doesn't have anything to prove. What a cop out! Another minor gripe is the nostalgia angle, which just seems to cram as many references to the 1990's into sight without any consistency (literally anything from 1990-1995 is just stuffed in there). Some may say that my opinion is invalid because this film wasn't made for me, to which I'll give them my finger. It's something which really annoys me actually. Films in general are an art form which are accessible for anyone and everyone to watch and decide themselves whether or not they like it. Enjoyment is subjective. Don't let Hollywood studios take that away, or you will just become consumers to be exploited and nothing more.